Accomplished and energetic instructor with a solid history of achievement in school environments. Motivated leader with strong organizational and prioritization abilities. Areas of expertise include collaboration, planning and communication. We grew the schools Naval Junior Reserve Officer Training Corps into the largest unit in the state of Arizona with collaboration in the primary surrounding schools. Coordinate with local military recruiters on a weekly basis appointments and presentation opportunities. Meet with students and administrators on academic advisement. Collaborate with parents on academic achievement. Teach Naval Science to over 150 cadets. Naval Science Instructor in the Department Of Defense-Europe school system Rota, Spain. Coordinated, planned and organized commercial air travel and ground logistical travel to four European countries while the head football coach. We won the championship! Taught Naval Science to 40 cadets. We started the first ever Naval Junior Reserve Officer Training Corps at Cortez High School collaborating with school officials, local community and the U.S. Navy. 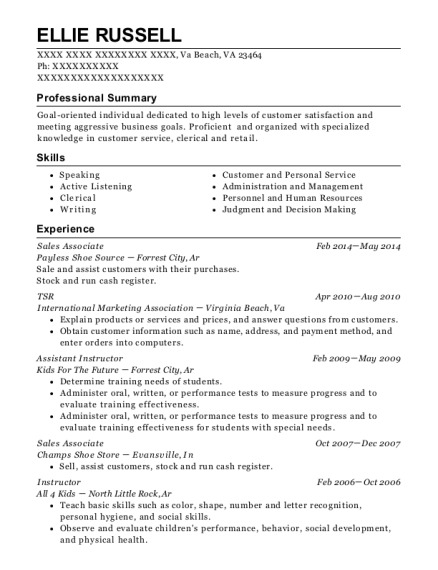 Manager of supply budget over $20,000.00 from the U.S. Navy. Taught Naval Science to over 100 cadets. Provided liaison for Head Quarters Marine Corps at Camp Pendleton, CA for all reserve Marines attending school after basic training. This was independent duty. Maintained various aircraft for mission capable readiness. Established work procedures or schedules and kept track of the daily work of Marines conducting aircraft maintenance. 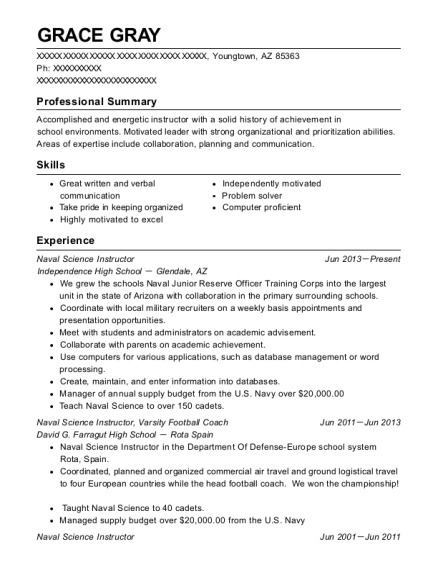 This is a resume for a Naval Science Instructor in Youngtown, Arizona with experience working for such companies as Independence High School and David G Farragut High School. 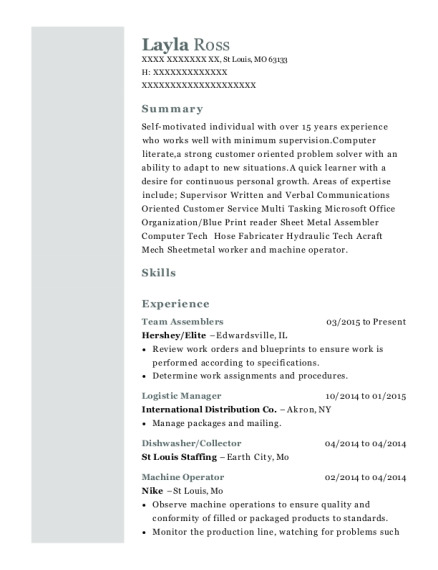 The grade for this resume is 0 and is one of hundreds of Naval Science Instructor resumes available on our site for free. 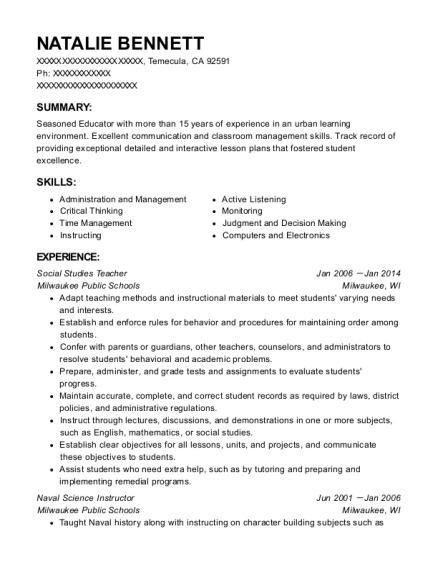 Use these resumes as templates to get help creating the best Naval Science Instructor resume.